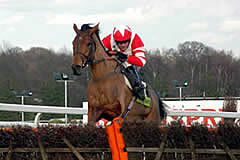 Robert Thornton partnered his third winner of the 2008 Festival when pushing Nenuphar Collonges out to take the Albert Bartlett Novices’ Hurdle in the race’s final strides. "The horse was off the bridle for two and a half miles and it was a wonderful ride," said winning trainer Alan King. "I thought he had a huge each-way horse beforehand and he was one I was looking forward to running all week. "I’ve said all along that when others cry enough, Nenuphar Collonges will keep going. He’s actually won quite cosily in the end and it’s not bad for an old chaser. The owners are wonderful. They thought I was totally barking when I said I wanted to go back hurdling with him this season. But he was a maiden and pretty high in the weights over fences and so we thought we would have a bit of fun." Thornton added: "He’s always been hard work and wears blinkers but you wouldn’t call him ungenuine. He needs a lead and from the bottom of the hill I thought I would get there." The winner received a quote of 20/1 for next year’s Ladbrokes World Hurdle with Paddy Power. Charles Byrnes, trainer of Liskennett, the two-and-three-quarter length runner-up in the Grade One Albert Bartlett Novices’ Hurdle, was happy with the mare’s performance. The Irish handler said: “To have gone so close, I am obviously a bit disappointed not to have won. “However, I am delighted with the mare and she gave 100 per cent. “She could possibly have one more run this year, possibly at Punchestown. Graham Roach, owner of the third-placed horse The Tother One said: “We’re delighted with that. “He’s certainly answered the question about whether he could stay three miles. “I thought, for a minute, that he was actually going to win it. We might give him one more outing this season, we might not, but next season he’ll definitely go chasing. 1. The Albert Bartlett Novices’ Hurdle was added to The Festival in 2005 and provides a valuable opportunity for staying novice hurdlers as it is run over three miles. Initially sponsored by Brit Insurance, it is backed by Albert Bartlett for the first time in 2008, coinciding with its upgrade to Grade One status. 2. The inaugural running went to Moulin Riche, trained by Francois Doumen in France and partnered to success by Robert Thornton. 3. Trainer Jonjo O’Neill and jockey Tony McCoy have combined to take the two other runnings with impressive winners – Wichita Lineman, who scored by 12 lengths last year, and Black Jack Ketchum, a nine-length winner in 2006.